This weeks lesson discusses an interesting contrast of stories from John 3-4.
v.1 Nicodemus was a Pharisee and a ruler of the Jewish people. That is to say he knew the law and he knew the prophets. He had all the possible help at hand to be able to understand the scriptures and recognize the Messiah like Simeon or Anna or anyone else we have thus far met in our New Testament study. v.2 It's not stated clearly here but Nicodemus' seems to be asking who Jesus is and what is his purpose. He asks the question by essentially saying, "Listen Jesus, we know you are a good man because of the way you teach and the miracles you do but who are you, what are you trying to accomplish here?". This does not seem to be a sincere attempt to establish who Christ is but whether he will be a threat to the Pharisee's teachings and establishment. Note also the setting. Nicodemus comes to Christ at night. We are not sure if he comes of his own volition or if he was sent by his fellow ruling Pharisees who do not want to be seen approaching Christ during the day. Either way, Christ takes this as an opportunity to teach Nicodemus personally. v.3 His response to the unasked but implied question is "you will never really understand who I am until you are born again." I like the way the dark night adds to the feeling that although Nicodemus can literally see Jesus, he can't see him for who he really is. His spiritual sight is still unable to perceive the Messiah standing in front of him. 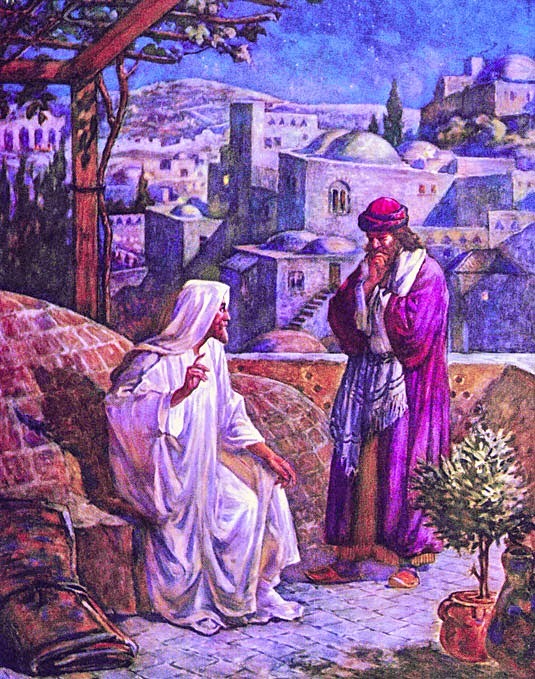 Nicodemus here foreshadows the entire Jewish people rejecting the Saviour, unable to realize or see him as anything beyond the son of Joseph. v.4 Nicodemus is obviously confused, taking Jesus literally he wonders how someone can be born twice. v.5-8 Christ, possibly recognizing some sincerity in Nicodemus does try to explain that being born twice involves a physical birth AND a spiritual birth. He tries to teach him that not everything is literal or physical. This is a big deal and quite apt for a Pharisee as everything they do is literal and physical. They took the old law and made it a ritualistic hollow series of actions, stripping it of all spirituality. Christ tries to tell Nicodemus that the Spirit is not a physical thing you can see but something that you feel and see the effects of. v.9 Nicodemus does not understand Jesus though. v.10-13 At this stage of the conversation Christ now points out the obvious: "how can you have studied the scriptures all your life and miss the actual meaning. This is just the basics of the gospel. I can't even start to discuss deep doctrine with you." How many of us have neglected to study the scriptures with spiritual eyes? How many read it daily and do good actions but miss the whole point and fail to understand the "why" of what we do? How many people today have the scriptures by our bedside or in our bookcase but have not invited Christ into our lives? That is the question Nicodemus is asked. v.14-15 Christ continues to try and help Nicodemus understand that he is the Saviour by relating back to a story Nicodemus must have known very well. 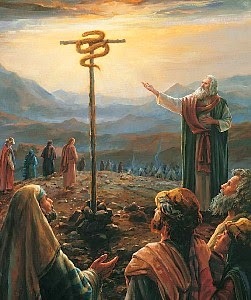 He compares the brass serpent that Moses lifted up in the wilderness to himself and tries to point out the symbolism to Nicodemus, prophesying of his own crucifixion. Of course the irony here is that even as then people refused to look at what was right in front of them, even so Nicodemus refuses or is unable to see the Christ who is mighty to save, right in front of him. v.16 And then with the simplest doctrine of all, Christ further explains the great plan to Nicodemus. And all we have to do is believe and see. v.19-21 And then his summary "But Nicodemus, this is the problem. Standing in front of you is the Messiah, the Christ, the light of world - but you choose to come to me in darkness and sneak around afraid to be seen with me. Until you accept me and choose to be seen with me in the light you will remain condemned to darkness spiritually." It is a powerful visit with a man who should have known better and a powerful lesson to all those who profess to be religious. Then comes act two of this fascinating contrast that John purposely sets up for us. v.5-6 Note the setting here. Despite no longer being the seat of the Jewish people or their laws, there is deep spiritual resonance in this setting. It is here that Jacob settled after returning to the Holy Land. And what was the time? It is the sixth hour. What time is that? The Jews used to measure time by the rising of the sun. So the 6th hour was the 6th hour after sunrise. This was considered high noon! So compared to the visit of Nicodemus at the dead of night this story is happening at the height of the sun. There is more than enough light here. v.7 Note also here the contrast to the previous story: Nicodemus of the chosen people, a teacher of the scriptures and the ruling class compared to a woman of no importance and of a people who were considered unworthy of the covenant blessings. Sometimes we think we know who is righteous by outward appearances. I think John is clearly showing that Christ's judgement is not based on outward appearances at all but on the heart. Being Mormon doesn't save us anymore than being a Pharisee Jew saved Nicodemus. Those that will be saved are those of sincere heart who are born again and accept Jesus as the Christ in thought and in deed. And Jesus, possibly recognizing the woman's heart and sincerity asks her for some water from the well. v.9-11 I love how this very human of conversations unfolds. The woman is shocked that a Jew would even speak to her. And Jesus immediately dismisses the enmity between Samaritans and Jews by saying "If you knew who I was and what I offer you would have asked me for water, living water!" 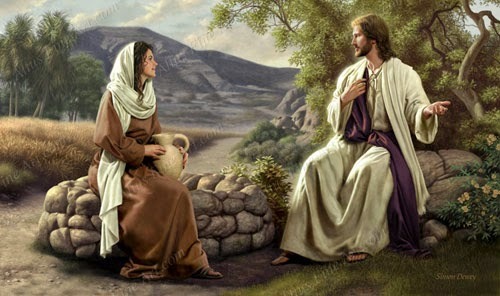 v.12 She politely responds, questioning how he can give her living water when the well is deep and he doesn't have a pot to collect the water! And then she dares to ask the question that Nicodemus didnt dare ask. "Art thou greater than our father Jacob?" This openness and this sincerity without guile also sets her apart from Nicodemus' more sly and confused approach. v.13-14 Christ then explains that the water he gives is not from the well but it is water that if drunk will mean she will not thirst again. Christ is obviously, as with Nicodemus, speaking spiritually. v.15 Again another contrast to Nicodemus. I am not sure the woman understands fully what Christ is saying but rather than saying "What? That doesn't make any sense!" Her reaction is more innocent and curious. "Give me this water. So I don't have to come here to this well every day and draw water every day and drink every day." Or in other words, "Please make my life easier!". v.16-19 Christ perceiving her openness to his message and yet discerning she is not quite getting it yet, proceeds to prove his prophetic spiritual abilities by explaining her personal situation. There is something about this conversation where you get the feeling that the woman is maybe flirting with this stranger. Here is a woman who has had five husbands. We do not know the circumstances of those marriages or their end but she is now instead living with a man but not married. To hear from a stranger that he will take away her work and provide for her living water may have been just what she wanted to hear and so she tells truthfully she has no husband but maybe purposely leaves out the fact that she is living with someone. "This strange but sincere man is offering to look after me forever!" But when Christ shows her that he knows more of her life, she starts to realize that this is not another suitor but the Saviour. She is cautious but again more direct than Nicodemus. "I perceive that thou art a prophet". v.20-24 Now Jesus can see that she is ready to be taught of spiritual things and tells her that salvation must come of the Jews but the location of where you worship God is far less important. God just wants people that will worship him in actions and in the desires of their heart. They are those who will be saved. v.25 Now the woman is clearly interested but still cautious, she utters her last statement. One presumes she must have by now, based on the progression of the conversation, had some idea, some hope, that this man was Christ. And she pushes it to that point by declaring she believes in a Messiah and when he arrives he will tell her. In essence she is forcing the Saviour to reveal himself to her. Notice the gradual progression of her realisation that this man at the well is indeed the Saviour as illustrated by the pointed questions she asks. Unlike Nicodemus who came in darkness and left in darkness, this woman already had a light within and left with more light. "Art thou greater than our father Jacob?" "I perceive that thou art a prophet." "I know the Messiah cometh...he will tell us all things"
The Saviour cannot leave now without clearly revealing who he is. If he does she will look elsewhere for a Messiah. And so her faith, despite being a lowly woman of Samaria is still stronger than the most learned of the Jews and she is rewarded for her faith. v.26 Jesus saith unto her, I that speak unto thee am he. That ranks among the many other scriptural moments I would love to have been present at. This is a powerful declaration and testimony of himself and his divine mission. Her reaction is a clear foreshadowing of the gospel mission Christ himself preaches - to declare the good news to all and so she goes back to town to tell the men that the Messiah has arrived. v.39-40 Many believe on her words and he is invited to stay and teach them. He stays 2 days and as a result many more believed declaring "this is indeed the Christ, the Saviour of the world". In essence there are two groups of people, those that sincerely are looking for the truth and those that are not. Sometimes those we think are sincerely searching for truth are not and sometimes those we might ordinarily dismiss are in fact the ones that are ready for the gospel. John clearly shows that the gospel will only save those who are sincere in their search for the Christ. Additionally if you are sitting at home, lonely, forgotten, worn out, bowed down by life or even heartache doing your best to make ends meet as a single parent, take note. Christ has time for you. He is not a respecter of position or wealth. He is seeking for those who seek the truth. He can provide living water. He can save. Just come to him, be born again.